St. Peter’s Basilica. The Church and the square of St. Peter occupy the very historical spot of the circus of Nero where many Christians, accused and convicted of having burnt Rome, suffered martyrdom (as is mentioned by Tacitus and Seneca) and where St. Peter was crucified. The remains of these early martyrs, were piously collected by Christians brothers and widows, to give them Christian burial in the neighbouring caves and grottoes, where the apostle Peter was also interred. With the death and burial of the Great Apostle, was not extinguished his sacred memory, nor diminished the love of the sepulchre (In spite of the fierce persecution) the pious and devout pilgrimage, which continues down to our days. The first building which arose here, to mark the tomb of the prince of the apostles, (memoria Beati Pietri) was a small chapel which according to the Christian tradition was erected in the year 90 A.D. by Anacletus 3rd Bishop of Rome. This chapel, at once the centre and cradle of primitive Christianity, became very soon the object of universal veneration among early Christians and , later on, the official cemetery of the successors of St. Peter. In 323, the Emperor Constantine began the erection of a large Basilica on the site of the former oratory, participating in the work with his own hands, and himself carrying twelve baskets of earth, in honour of the twelve apostles; so that the simple primitive chapel of Anacletus, was transformed into a Basilica, more worthy of the sanctity of the spot and of the sacred associations connected with it. Official Rome Guide, Rome walking city Tours. The Liber Pontificalis describes, how the tomb of the apostles was opened at this time, in presence of Pope St. Sylvester and of the Emperor Constantine, the bones found and reburied under the altar, in a precious sarcophagus of gilt bronze, surmounted by golden cross weighting 160 pounds (72 Kilos). Such was the veneration, in which the tombs of the apostles were held in the early days of Christianity, that during the different invasions, these tomb, which stood unfortified and undefended, in churches outside the city walls were respected. In fact, we know that Alaric with his Goth, Vitiges with his Longobards and Genzeric with his Vandals ransacked and carried away the treasure of all the churches outside the city, but these savage and rude barbarians, who were mostly Arians, enemies of Rome and of the Catholics, although they knew the immense treasures the churches of the Apostles contained and in spite of their thirst for gold, not only respected them and the tombs , but left unmolested also the people who had taken refuge in them. In 846 when the Saracens invaded Rome, the Basilica was plundered and very much damaged for the first time, and some authorities maintain that even St. Peter tomb was profaned. 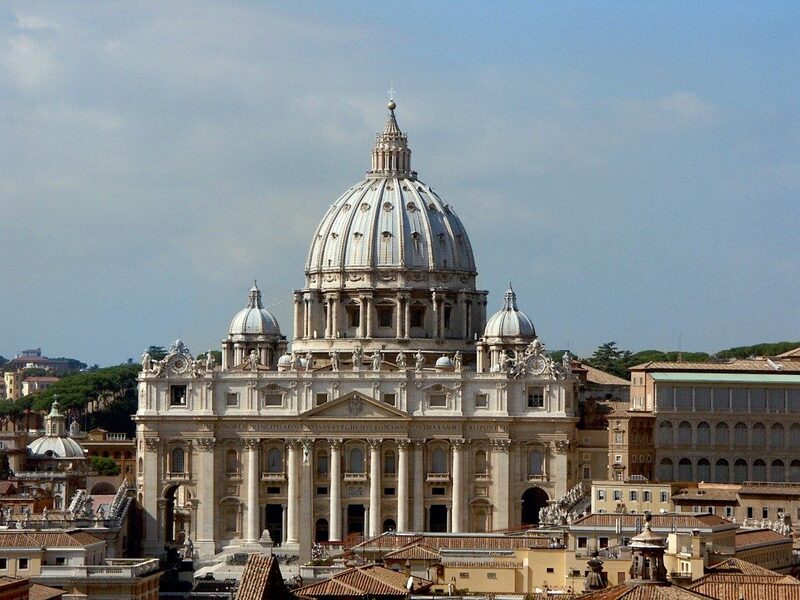 The damages of the Saracens were restored by Pope Leo IV, who raised also the fortifications around the Vatican. After this first devastation, nearly all the successors of Leo IV contributed to embellish the church with the rarest and costliest of old and contemporary art, and all the nations, which had been irradiated by the light of Christianity, enriched it by their prodigal presents, so that the basilica became a real museum, in which every century left deep impression of its art. In 1450, as ruin was menacing the precious Sanctuary, Pope Nicholas V planned the destruction of it and the rebuilding of a large and more beautiful church, but died before he could carry out his plan, which was resumed by Pope Julius II, (after an interval of about fifty years) who invited all the greatest Italian artists to submit designs. These were allowed to follow their imagination without regard to time expenses, and were requested to design the most wonderful temple human imagination could conceive, or human labour execute, the chief ornament of which had to be the monument of the pope. Bramante was the successful competitor for the plan of the church, while the monument of the pope had to be executed by Michelangelo. Guide of Rome. It would lead us very far from the scope and limits of this modest work, if we made a detailed description of the vicissitudes of the reconstruction of the basilica, it will be enough to say that plans were so wast and the interruption of the work so frequent (owing to the death of the Popes and architects) that 120 years elapsed between the laying of the foundation stone (1506) and the consecration of the building (1626) another 50 years for the completion of the church and if we include the sacristy and the mosaics, the rebuilding of the basilica lasted altogether nearly three centuries. Official Rome Guide, Rome walking city Tours.